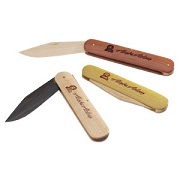 If you don't see an item in our Line that you would like made, just ask. 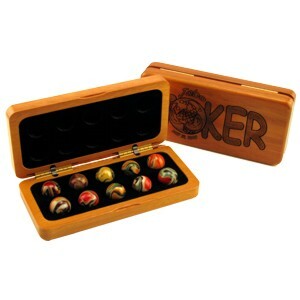 We specialize in custom products using various wood species, both domestic and exotic. Unlike imported custom work, you don't have to order huge quantities or three to four months to make custom feasible. Starting with quanitites as low as 25 pieces and three to four weeks production time, your custom product can become a reality at a reasonable cost. Large quantities can further reduce your cost. We focus on creating an easy, informative and seamless process of taking your ideas and producing the product that you envisioned. We strive to be your supplier of choice for wood and natural material products. 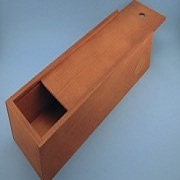 Box (Left) - A “stick built” box with a hinged “flat” lid. 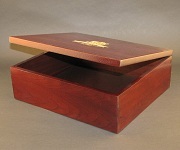 Dark red mahogany finish with a laser engraved logo and gold color fill. 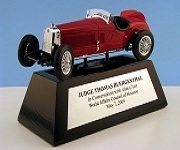 The box was packed with other gift items and given to VIP’s at one of the world’s most prestigious horse races. 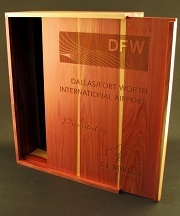 Box (Left) - When the DFW airport welcomed a world renowned chef to one of their restaurants, they wanted a box to collect purchases and asked the chef to personally sign each wood box with a Sharpie® marker. 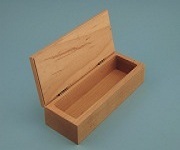 Stick built slide out lid using aromatic red cedar wood. Box (Left) - When the Charlotte Bobcats send out their season tickets to “special fans”, they do it in style. This solid walnut, hinged lid box was actually produced in two sizes and contained season tickets, parking passes, a facility map and more. 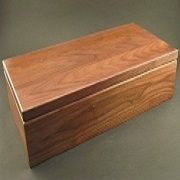 Box (Left) - Here is a good example of a routed box. 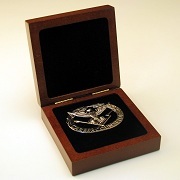 Milled from solid wood, this walnut finish box has a custom cut foam interior to properly display the customer supplied badges. 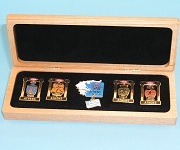 A personalized name plate of the recipient was added below each badge. Box (Left) - The Cleveland Cavaliers have just “one goal”; a world championship. 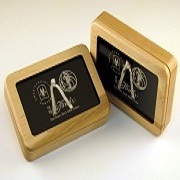 While they ultimately fell short of their goal, the black lacquer box was a huge success. A gold imprint on the lid displayed the Cavaliers’ One Goal logo. Box (Left) - Sometimes good quality advertising is clean and simple. When you are the largest wood pencil manufacturer in the world, you also need a good quality wood box to send out your newest samples and ideas to your best distributors. Solid maple with a natural finish and laser engraved ad copy on the lid. Box (Left) - American Unions want American made products. 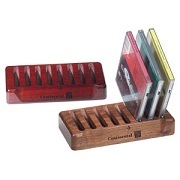 This solid walnut hinged lid box has a glass window in the lid to showcase the beautiful American made pocket knife. We back etched the glass with the union name and convention site and date. Box (Left) - Wine boxes are always a common request, and sometimes it is all about budget but they did not want a low quality import. Consider this version, made from birch plywood and a custom mix light chestnut stain, Custom sized to fit their bottle, filled with raffia and we applied a customer supplied wine bottle decal to the lid. Puzzle (Left) - Many companies have fundamental principles. Rheem wanted to graphically drive their principles home to their employees in a training program. 3 differently stained wood pieces interlock into the center piece. 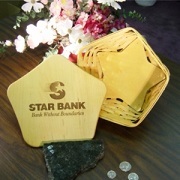 Puzzle (Left) - Our newest technology was utilized by a Canadian Bank as they wanted to reach new depositors under the age of 15. 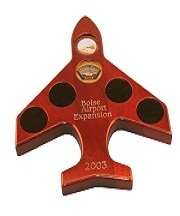 This graphically stimulating puzzle also teaches young investors while entertaining. 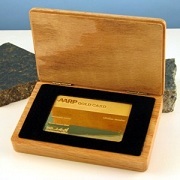 Box (Left) - AARP selected us to make their box to properly display a gold plated Membership card. Not only do we make the box right here in our factory in Ohio, we also made the custom cut insert foam to hold the card in place. 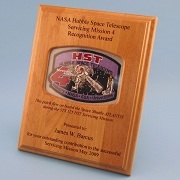 Plaque (Left) - The Space Shuttle Program was not just historic, it was and achievement of American ingenuity and capabilities. NASA wanted to forever preserve patch replicas of the one’s worn by the Astronauts to be displayed for years to come.